Did you know that many baby animals that are found on their own outside should be left where they are? REMEMBER, ANIMAL MOTHERS ARE BETTER AT LOOKING AFTER THEIR BABIES THAN HUMANS ARE, SO IF POSSIBLE ALWAYS MAKE SURE THE BABIES STAY WITH THEIR MOTHERS! Many mothers have special nutrients in their milk that their babies need, and that formulas cannot replicate. For example, baby bunnies are tough to rehabilitate because baby bunny formula cannot match the excellence of mother bunny milk! If you find a baby animal, make every effort to reunite it with its parents, and this may be just a matter of letting it be (see below for more information). Watch the baby from a distance if possible to determine whether it is an orphan. If it is not an orphan and you take it, this is equivalent to kidnapping! If it appears to be in distress, or injured, call a rehabilitator for advice. 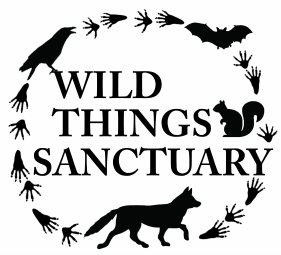 Whatever happens, DO NOT RAISE THE BABY YOURSELF; wild animals have special needs and it is illegal in New York, as in most other states, for residents to possess most native wildlife. Sometimes you find a baby without its parents nearby. That doesn't mean that it's abandoned. Do not take the baby before ensuring that there are no parents around. Sometimes parents may only come feed their babies a few times a day under cover of darkness. A fledgling sparrow about to leave the nest. 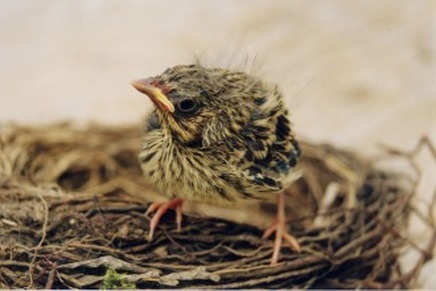 Young birds who are just beginning to fledge may end up on the ground, but will eventually get back into their nests, or their parents will feed and look after them on the ground. Let their parents find them. Baby bunnies are left in their nests most of the day while their mother is out eating. If a nest is disturbed, instead of taking up the baby bunnies, reconstruct the nest and watch it for 24 hours to see if the mother returns. You can put string or ribbon over the nest in a tic-tac-toe pattern, and if that is moved it is good evidence that the mother has returned to look after her babies. The preferred mealtime is between mid­night and 5:00 a.m. If you want definite proof that the babies are being cared for, check them early each morning. They should be warm and round-bellied. The best way to know for sure is to weigh them on a small postage scale or kitchen scale. Write down a description and the weight. If they're gaining weight (1/4 oz. or so), they're being fed. 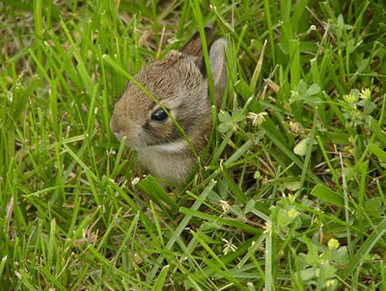 Also, baby bunnies set out on their own when they are only 3-4 weeks and still very small, so if they are found on their own they may have already left the nest and it is best to leave them alone. 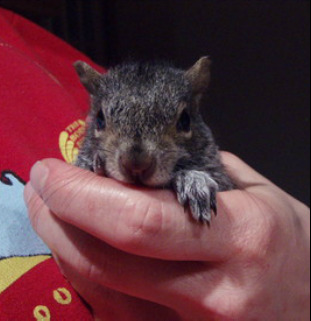 Baby squirrels end up with wildlife rehabilitators for many reasons. Sometimes they are presumed to be orphaned, but really they are just separated from their mother. Lost babies may come up to people and appear "friendly," which indicates that they are still nursing and need their mother. Mother squirrels will rescue their stray babies, carrying them back to the nest. If you find a small baby, attempt to locate the nest (nests are is often a big ball of leaves at the top of a tree), and try to get the baby to climb up the trunk. You can also place the baby in an open box at the base of the tree, and the mother should be able to find the baby there. 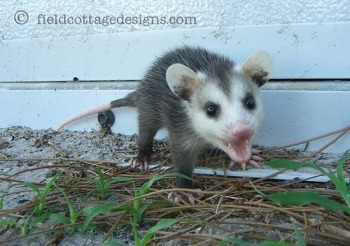 Baby opossums stay in their mothers' pouch until they are about 2 months old, then they ride along on her back until they are about 4 months old. These babies are often brought to rehabilitators after their mothers have been killed and the babies are found in their mother's pouch. 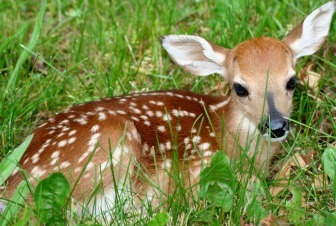 Once they are about 8 inches long (not including the tail) they can survive on their own, but if they look very small or appear to be unwell, always call a rehabilitator to make sure they are OK.
Fawns are also left alone by their mothers for a lot of the day while the mother finds food. 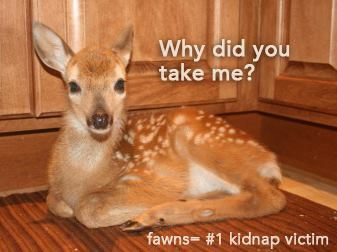 Do not bother the fawn. If you are concerned, keep a watch on the animal to make sure the mother returns.